I was shooting an incredible destination wedding at a private home on the shores New Bern, NC. For the details, I wanted to bring in the elements of nature and water that were everywhere. I was especially enchanted with the cypress knees that were all around the water's edge and were such an element of the local landscape. 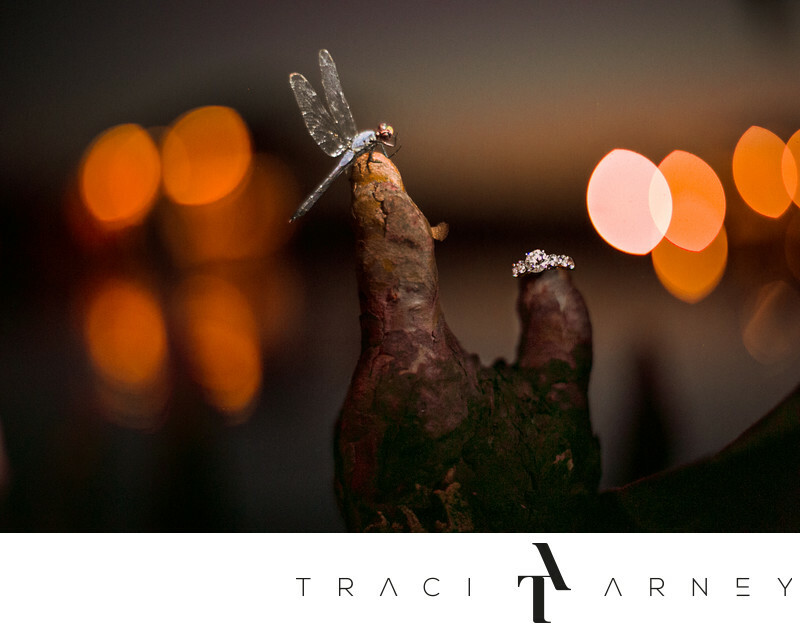 My assistant noticed a beautiful, but sadly, recently departed dragonfly and I immediately wanted to incorporate it and the these gorgeous cypress knees into one of my ring shots. We placed the dragonfly on one of the knees and it stayed in position. Since I am always extremely careful with rings, we creates a very large mat of fabric around the cypress knobs to prevent the ring from falling in the water. To get the lighting for this image, we used an off camera flash with 2 grids at 1/32 power as well as iPhone flashlights to give a little more directional fill. I laid down in the water (as I am known to do) to get the right angle for the shot. The bokeh of lights is created by boast out on the water. This is such an unusual ring shot and it's very true to the special location the bride and groom chose for their wedding. It's took a lGay Weddingot of work but it was worth every second as well as drenched clothes! Keywords: Destination Wedding (186), Detail (189), dragonfly (6), Lake Wedding (9), NC (636), New Bern (30), Ocean Wedding (9), Private Home (12), Ring Shot (33). 1/50; f/1.4; ISO 3200; 50.0 mm.